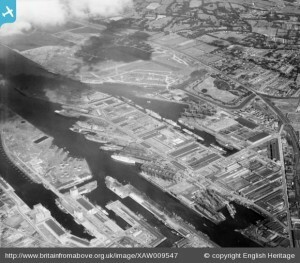 Home / Posts Tagged "Coleraine"
Harland & Wolff, Belfast, Belfast, Northern Ireland, 1947. Oblique aerial photograph taken facing East. History Hub Ulster welcomes the release of previously unseen vintage aerial photographs of Ulster by the Britain From Above website. The site has recently published many unseen vintage aerial photographs of Ulster covering the 1920’s through to the 1950’s. Within the archive are aerial photographs of the Antrim, Ards, Armagh, Ballymena, Ballymoney, Banbridge, Belfast, Carrickfergus, Castlereagh, Cavan , Coleraine, Cookstown, Craigavon, Derry, Donegal, Down, Dungannon, Fermanagh, Lisburn, Larne, Magherafelt, Moyle, Newry and Mourne, Newtownabbey, North Down, Omagh and Strabane areas. The photographs will interest everyone from local historians, railway enthusiasts and heritage fans to name a few. Britain from Above is a four year project aimed at conserving 95,000 of the oldest and most valuable photographs in the Aerofilms collection, those dating from 1919 to 1953. Once conserved, they are scanned into digital format and made available on this website for the public to see. This project has been made possible due to a grant from the Heritage Lottery Fund and support from The Foyle Foundation and other donors. The website launched with the first 10,000 images and as we currently have little information about the details in the images, the website provides the opportunity to share and record your memories and knowledge about the places shown in the collection.